Beacon events at cathedrals, prayer buses, open churches and prayer walks have been a feature of this year's Thy Kingdom Come campaign between Ascension Day and Pentecost. Archbishop of Canterbury Justin Welby said last week: “The astonishing spread of prayer in these days of TKC has continued on 2018. Worship was led by Phil Gouldstone and the band from Burn 24/7 Norwich. 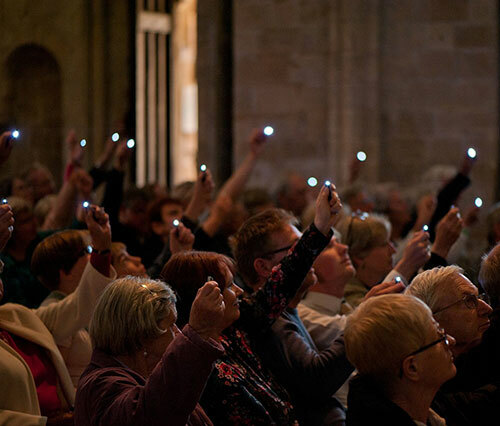 Hundreds of people from churches across the Diocese packed out Chichester Cathedral on Sunday 20 May (main photo) for the Pentecost Thy Kingdom Come Beacon event to celebrate the gift of the Holy Spirit with worship, music and readings. A prayer space welcomed hundreds of visitors throughout the week. Bishop of Lewes Richard Jackson visited 50 churches between 14th and 18 May, lighting a candle at each one, and was welcomed to a Prayer Bus in Maresfield (pictured).